Today's nails are a really easy but very pretty glitter gradient! 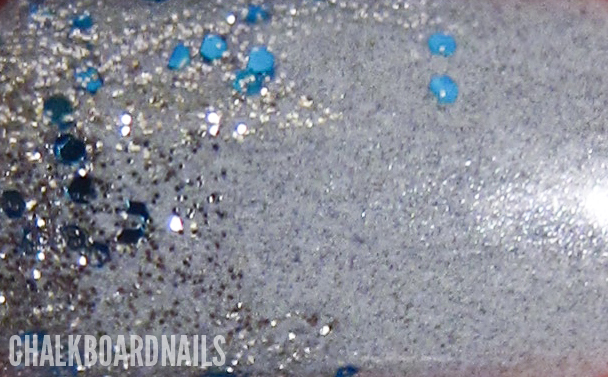 You only need two polishes for this -- a base color and a dense glitter in a clear base. I started with a base of two coats of Misa Grey Matters. Okay you guys, I am seriously in love with this polish. It is amazing. Such a smooth medium grey, but then it also has dark flecks of dark grey in it. It's so beautiful, it looks like a wool coat or a river stone or something. Then I took China Glaze Lorelei's Tiara (from their new Eye Candy collection) and painted it messily backwards down from the tips. I did one thinnish coat over the top third of the nail and then added extra glitter at the very tips to make it more dense there. I only picked up three of them, but I'm sure any of the Eye Candy glitters would work nicely for gradients. If you are doing this look, make sure your glitter of choice is dense. It's hard to achieve a gradient effect with a sparse glitter; it'll end up just looking like you did a poor application job most of the time. 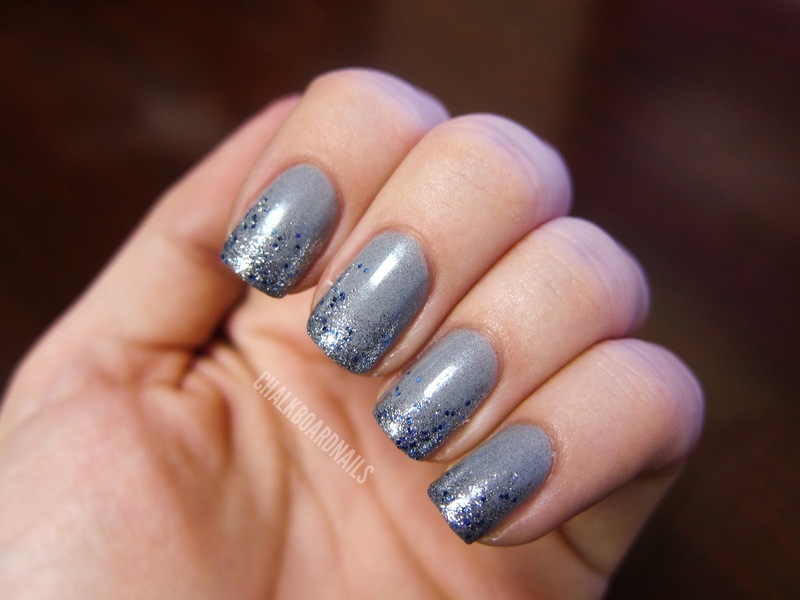 Here is a close up of this manicure so you can see how pretty Grey Matters is. I'm seriously over the moon about this polish. You can snag one at Transdesign. I hope you all enjoyed this manicure! Have a fantastic Thanksgiving and try not to get trampled to death on Black Friday! I love it! 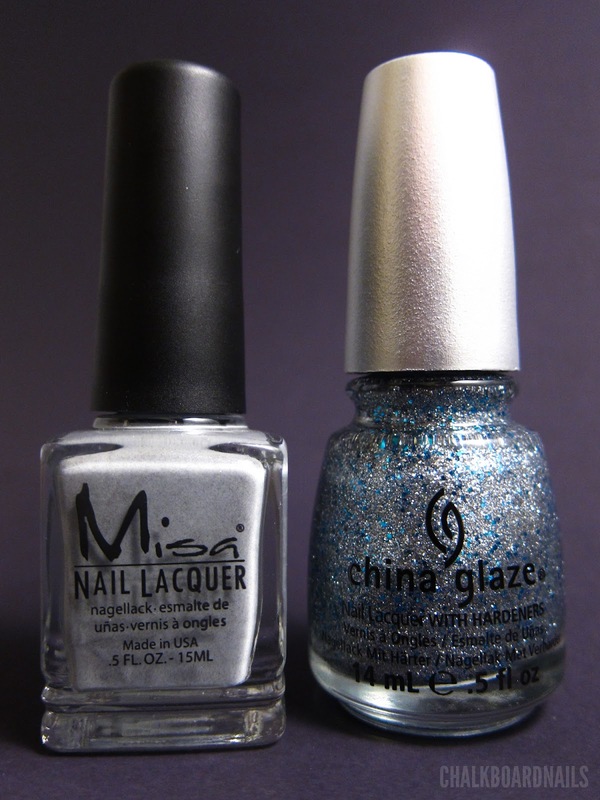 I think I'm gonna get those 2 polishes! Wow, very pretty! These two colors compliment each other well. Love it! I just got the CG and can't wait to use it. oooh that Misa is gorgeous!! and the more i see Lorelei's Tiara, the more it grows on me! Wow I really love how the glitter gradient makes it 'pretty'. I have Misa's Grey Matters, and I was not as impressed when it was in the bottle, but absolutely fell in love when I saw how gorgeous it was on my nails! So pretty, and wintery!! I'm loving blues and greys these days! Grey Matters is gooorgeous -- the dark flecks really make it a stand-out. Need to find. Great job with the glitter gradient, too. I'm loving those lately. Oooooo so pretty! Lovee that glitter!! I love the glitter. It was positioned so carefully. It looks great! Just bought Tiara this weekend. I was thinking I'd use it as a gradient over a Navy Blue - but I LOVE this! It's gorgeous polish. Thanks for posting it. I'm a grey lover so I'm just so impressed by your mani <3 gorgeous! This is gorgeous! I may have to try this - just got y Lorelai's Tiara in the mail today. New follower. Love your blog! Thanks so much for taking the time to submit such a comprehensive, beneficial post. I've been being "swayed" by all the positive talk. A valuable information is also available here. Nice nails. Thanks for sharing. This is awesome I like it that I wanna come beck on your blog for more information.